It wasn’t just thousands of Browns fans that braved single-degree temperatures in January for the “Perfect Season Parade” after the Browns went 0-16 in 2017. There were a smattering of Steelers fans who came to point and laugh—all they can do for what was once one of the NFL’s great rivalries. There were a few Buffalo fans, sharing in the strange bond between the Browns and Bills, united by cold weather and heartbreak. And then there were Lions fans, including some with signs that said “Welcome to the Club.” The Browns and Lions are the only two teams in NFL history to lose every game in a 16-game season. It was near the extent of living memory, back in the 1950s, when their respective home cities were at their peaks and the Lions and Browns ruled the NFL; they met four times in a six-year span in the league’s pre–Super Bowl championship game. But after trouncing the Browns in the 1957 NFL title game, the Lions slid into irrelevancy, and the Browns soon followed, with decades of mediocrity broken up by occasional flashes of brilliance. The Browns’ and Lions’ decline coincided with the fortunes of their home cities as well, as deindustrialization and fracturing along racial lines took its toll. Both teams remain the only NFL teams that existed prior to the NFL-AFL merger without a Super Bowl appearance. After going 0-16 in 2008, the Lions have rebuilt if not to respectability, than enough to hand the title of NFL laughingstock fully to the Browns. For what it’s worth, the Browns beat the Lions last week in the final preseason game. (It’s not worth much; both the ‘08 Lions and the ‘17 Browns went 4-o in preseason before going winless in games that counted.) Perhaps better days are ahead for the Browns too. At least, it’s unlikely things can get worse. Even though the NFL at the time took a backseat to Major League Baseball, it wasn’t a bad time to be a football fan in either city. The Browns—started in 1946 on a whim by Mickey McBride, an eighth-grade dropout who’d never even seen a football game until his son went to Notre Dame—dominated their first home, the All-America Football Conference, thanks to the genius of coach Paul Brown, himself a Northern Ohio native. Brown’s innovations include things now taken for granted in the NFL, from playbooks to timed 40-yard dashes to the draw play to facemasks on helmets. The Browns joined the NFL for the 1950 season, with the expectation they’d wilt in the face of stiffer competition (Adam Walsh, who had coached the Cleveland Rams to the NFL title in 1945, their last season before moving to Los Angeles, said the Browns were “an interesting team, but not good enough for the National League”). For their first game, the Browns went to Philadelphia to play the defending NFL champion Eagles—and beat them 35-10. The Browns went 10-2 and beat the Rams to win the NFL title. The Browns didn’t play the Lions that year, who at 6-6 were also-rans. But things were starting to change for them thanks to their acquisition of quarterback Bobby Layne, a blond wildman from Texas who threw hard and partied harder, and would be responsible for the team’s greatest successes. The Lions had won the NFL championship in 1935, the second season after their move to Detroit from Portsmouth, Ohio, but then failed to make the playoffs again until 1952, when they went 9-3 and beat the Rams to advance to the NFL championship game against the Browns in Cleveland. The Lions won that game to start a run of success still unequaled in team history—largely at the expense of the Browns. The Lions beat the Browns 17-16 in the 1953 championship game, with Layne leading a late drive for the game-winning touchdown. It worked, as the Browns routed the Lions 56-10. They followed that up with another title in 1955, this time beating the Rams. The Browns finished 5-7 in 1956—their only losing record in their first 28 years of existence—and then rebounded to meet the Lions yet again in the 1957 title game. This time, Detroit’s quarterback was Tobin Rote, filling in for Layne, who’d broken his leg earlier in the season. After the 1957 season, the Lions traded Bobby Layne to the Steelers, then the dregs of the NFL. In his bitterness, Layne allegedly said the Lions wouldn’t win a thing for another 50 years. Both cities saw population declines in the 1960 Census, and racial tensions came to a boil later in the decade, with riots in the Hough in Cleveland in 1966 and the Glenville shootout two years later. The “long hot summer” of 1967 saw riots on Detroit’s west side. Meanwhile, the Lions became known less for success and more for their celebrities (defensive lineman Alex Karras was starting to branch into an acting career, George Plimpton went through training camp with the team in 1964, the basis for the book and movie Paper Lion, and singer Marvin Gaye got a tryout in 1970). But the Browns remained one of the dominant teams in the NFL throughout the 1960s, winning a title in 1964 and playing for three more, in 1965, 1968, and 1969. “The Browns were as good as anyone in the NFL in the 1960s,” King says. By then, they were owned by Art Modell, a New York advertising man who had a vision for publicity, if not necessarily for football. In 1970, the 16-team NFL merged with the American Football League, which had 10 teams. To balance out the new National and American Football Conferences, three NFL teams would have to move to the AFC. The Colts, then in Baltimore, did so. Modell saw value in relocating to the AFL—literally, as Sports Illustrated reported that Modell would receive a $3 million payment for taking one for the team—but needed a rival. At the time, the Browns’ main rival for supremacy in the NFL’s Eastern Conference was the Giants (The Browns or Giants won the conference in every year save one between the Browns’ arrival in the NFL in 1950 and 1965). But the Giants were staying in the new NFC. So Modell convinced Steelers owner Art Rooney to make the move as well. But it was not to be. The move to the AFC coincided with the rise of the Steelers, a team that hadn’t even won a playoff game before 1972. The Steelers won six straight division titles and four Super Bowls while playing in a brand-new stadium. The Browns, meanwhile, couldn’t make the postseason and were playing in decrepit Cleveland Stadium. The city of Cleveland, struggling to keep its head above water, had turned over operation of the stadium to Modell, who was nearly as strapped for cash. It was particularly galling to Clevelanders, since Pittsburgh was fighting the same issues of deindustrialization and suburban exodus, but doing so as “The city of champions”—a nickname Cleveland held in the 1940s. Cleveland, meanwhile, was being regularly mocked by Johnny Carson on the Tonight Show. If the Browns’ move to the AFC hurt (In a bit of foreshadowing, Sports Illustrated said Modell was called “Benedict”), it was nowhere near as painful as the Lions leaving Detroit. The NFL decreed its teams needed to play in venues that seated more than 50,000, and Tiger Stadium—the Lions’ home since their arrival in Detroit—didn’t fit the bill, so the Lions decamped to Pontiac, 30 miles away. The Lions’ new venue was the Silverdome, a domed stadium that seated more than 80,000—and was built for football. If the 1970s started poorly for Cleveland—the Cuyahoga River caught fire in 1971, the 13th time it had done so since 1868 —they ended just as badly, with the city in default on its loans, brutalized by harsh winters and watching corporate headquarters flee, along with a short-lived NHL team. But at least for the Browns, things were looking up. The Browns won the division in 1980—breaking the Steelers’ six-year streak as division champs—and met the Raiders on a cold, wind-swept day at Cleveland Stadium. The game ended on “Red Right 88,” the fateful play that turned into a Mike Davis interception of Sipe, who would be named that year’s MVP. The Kardiac Kids also coincided with the rise of the comeback label that’s been applied on and off for Cleveland ever since. Dennis Kucinich, on whose watch the city defaulted, was replaced by George Voinovich, ushering in an era of public-private partnerships that yielded the Rock ‘n’ Roll Hall of Fame, the Gateway project with a new ballpark for the Indians and a new arena for the Cavs, and other downtown development. “There was this unbroken period of Cleveland turning the narrative around,” Souther says. But the Browns were unable to get over the hump. Sipe was lured to the USFL’s New Jersey Generals by a smooth-talking real estate developer named Donald Trump, and Bernie Kosar, himself a son of Northeast Ohio, became the Browns’ new quarterback. The Browns made five straight playoff appearances—including four division titles—from 1985 to 1989, but were thwarted in the playoffs each year, including three times by John Elway and the Denver Broncos in the conference championship, one game away from the Super Bowl. King believes the 1986 AFC Championship Game loss in Cleveland—in which Elway led “The Drive” 98 yards to score a game-tying touchdown—set the stage for the Browns’ move to Baltimore. But there wasn’t. Word got out in the fall of 1995—while Northeast Ohio was still hungover from its first baseball postseason in 41 years—that the perpetually cash-strapped Modell (described as a millionaire in a billionaire’s game) was moving the Browns to Baltimore. If his firing of Paul Brown 32 years earlier was, as one sportswriter said, like toppling Cleveland’s Terminal Tower, moving the Browns was like nuking the entire city. Meanwhile, the Lions of the 1990s were on a relative rise. Their offense, led by running back Barry Sanders, added another dimension with rookie wide receiver Herman Moore. In 1991, the Lions won the NFC Central and beat the Cowboys for their first playoff win since the 1957 title. (The Lions had won three straight Playoff Bowl games in the 1960s, but those games, featuring the conference championship game losers, were just exhibitions.) The Lions lost to eventual Super Bowl champions Washington, but it appeared the stage was set for more good years to come. The Lions did make four more playoff appearances in the 1990s, each as a wild card team, but lost every time. That victory over the Cowboys remains their last playoff win to date. The Browns’ most recent playoff win came a year before the move to Baltimore, beating the Patriots on Jan. 1, 1995 in a wild card game. But their biggest victory, King believes, came in 1999, when an expansion team took the field three years after the Browns moved to Baltimore. The NFL made an unprecedented agreement that a new team would be placed in Cleveland and it would be known as the Browns, keeping the colors, name, and team history. After the Browns’ return in 1999, there was an attempt to gin up a rivalry with the Lions with an annual preseason meeting—the Great Lakes Classic, including a trophy of a barge (which more than one person suggested bore an unfortunate resemblance to the most famous freight to sail the Great Lakes: The Edmund Fitzgerald). But the only real rivalry the Browns and Lions have had in the 21st century was a race to the bottom of the NFL, much as Cleveland and Detroit have been used for mockery or illustration of the Rust Belt—a term that has its popular origins in a Walter Mondale speech in Cleveland in 1984 talking about a “Rust Bowl” that had benighted the Midwest. 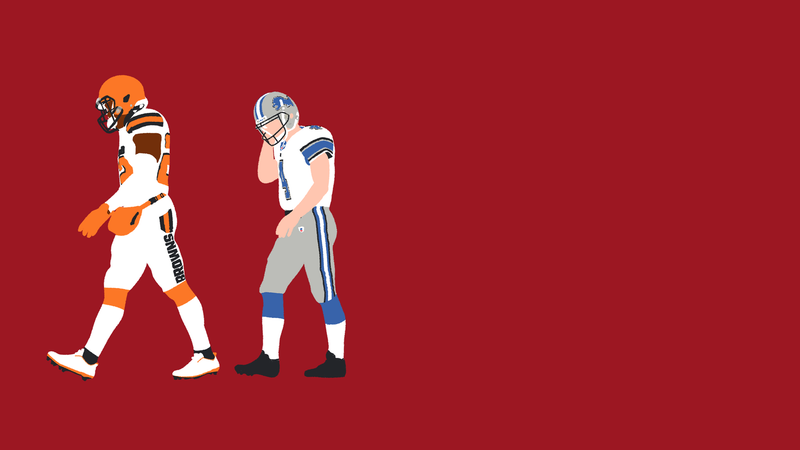 The Lions bottomed out in 2008, going 0-16—a feat Brandstatter concedes takes some skill and some (bad) luck. That coincided with a bottoming-out in Detroit’s economy, as the nation slid into the worst recession since the 1930s. Two of the big three automakers in Detroit went into bankruptcy, requiring federal bailouts. The Great Recession also took a toll in Cleveland, which is viewed as the epicenter for the foreclosures that showed how the housing bubble popped. The Lions have recovered, finding a quarterback in Matthew Stafford and making three playoff appearances (but still in search of that elusive win). And if you look at the area around Ford Field—the Lions’ new home, in Detroit, since 2002—it appears Detroit is doing better too. Brandstatter credited some of Detroit’s improvement to Dan Gilbert, who seems to be playing Monopoly with real money and buildings in downtown Detroit and Cleveland. The Michigan native is probably most recognized as the owner of the NBA’s Cleveland Cavaliers since 2005, but he made his billions with Quicken Loans, which is currently being sued by the U.S. Justice Department for fraudulent and predatory lending practices and its role in the subprime mortgage collapse. But while the Lions have gotten better, the Browns have gotten worse, without a winning record since 2007 and without a playoff appearance since 2002. Even more galling, Browns fans have had to watch the Ravens win two Super Bowls. The Browns went 1-15 in 2016, the year the Cavaliers won their first title and the Indians went to the World Series. Cleveland also hosted the Republican National Convention, setting the stage for a new round of stories detailing Cleveland’s comeback. The Browns refused to play along with any comeback narrative, following a 1-15 season by going 0-16. They remain a work in progress, much like Cleveland, Souther says.